BJP prime ministerial candidate Narendra Modi will win the Varanasi, party leaders said even as the last two days of campaigning in the Uttar Pradesh constituency were taken over by AAP, Congress and SP. 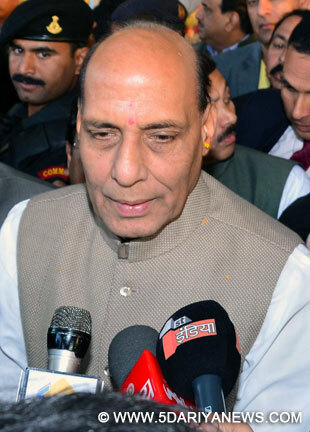 "We have done a big show, what more is needed," Bharatiya Janata Party president Rajnath Singh asked, while speaking to IANS here.Asked if the lessening on last two days would make a difference, he said: "It does not matter. "Rajnath Singh, who held a series of rallies across the country, was in the Hindu holy city Saturday as campaigning for the last phase of the 2014 polls came to an end.Modi, the Gujarat chief minister, chose Varanasi as his second seat in a bid to strengthen his image of a national leader. He is also contesting from Vadodara. A roadshow Friday by Aam Admi Party (AAP), whose chief Arvind Kejriwal is contesting against Modi, drew a crowd of thousands, while on Saturday, the city saw road shows by Congress vice president Rahul Gandhi for party candidate Ajay Rai.As soon as the Congress show of strength ended, Uttar Pradesh Chief Minister Akhilesh Yadav held a road show for Samajwadi Party (SP) candidate Kailash Chaurasiya.Both Congress and SP campaigns so far in Varanasi had been low key.BJP however said it would not make a difference.BJP's Varanasi's election incharge Ashok Dhawan said the voters have already decided, and the last minute campaign will not change that. "The people have already made their mind, they are just waiting to vote. So the road shows are not important for us," Dhawan told IANS.